Conzzeta is committed to value-oriented corporate management with a long-term perspective and strives for long-term value creation. This also requires giving adequate consideration to environmental, social and governance (ESG) issues in management processes, as well as transparent communication. An internal stocktaking survey was performed in 2017 as the first stage of a three-stage roadmap adopted by the Executive Committee. Following on from this, a materiality assessment was carried out in 2018. The objective of this second stage was to identify the key sustainability themes for the Group. It forms the basis for targeted and consistent reporting on the relevant themes, which is to be developed further as part of the third stage in 2019. Technical experts from all of the business units were called upon for the materiality assessment, and assistance was also sought from outside specialists. The key environmental, social and economic sustainability themes for the Conzzeta Group were determined as part of a three-step process (see graphic). As a first step, and based on the internal stocktaking survey performed in 2017, an analysis of selected sustainability standards and competitors was conducted to identify all potentially relevant themes. This involved reviewing, with outside assistance, several hundred theme-related aspects, which were taken into consideration for the purpose of defining themes specific to the Group and those specific to the business units. The second step was to transfer these into a modularly structured Group-wide list (which at this stage still included 27 themes) for validation and approval by a Group-wide ESG Steering Committee. During the third step, the materiality assessment was performed in cross-divisional workshops in order to prioritize these 27 themes for each business unit. The themes were evaluated on the basis of three criteria: their impact on the environment, society and the economy, their relevance to stakeholder groups, and their relevance to the company. The workshops were prepared and moderated by external sustainability experts, which ensured that outside perspectives were incorporated in the evaluation. The result of these workshops was a specific materiality matrix for each business unit of the Conzzeta Group. It prioritizes the key sustainability themes in accordance with the above criteria. The materiality matrices of all of the subsidiaries served as the basis for the aggregation process at Group level. They provide a solid and broad common basis for understanding and handling sustainability issues. the material themes: they are important because they have a major impact on sustainable development and, at the same time, are interlinked with major expectations of the stakeholder groups. Conzzeta plans to actively manage these themes, integrate them into strategy and incorporate them into communication. Of the 27 themes considered, nine have emerged as material for the Group (see graphic and the table in this section). They take into account the entire value chain and can have either negative or positive ramifications. They are also often tied in with developing business opportunities. Control of energy consumption and energy sources used. Minimizing the impact of climate change, including mitigating potential or existing impacts of climate change. Controlling the use of chemicals in production processes and their impact on the environment and society. Improvement of the longevity of the products and their recyclability (return to material cycles). Safeguarding and promoting the safety and health of customers and consumers. Controlling the circumstances and conditions under which employees perform their tasks, including health and safety. Ensure equal treatment and inclusion of all employees and promote diversity. Effects of own innovation achievements on environment, society and economy. Managing the long-term sustainability of the business models. Maintaining a healthy economic condition of the company. The relevance of these nine themes is also reflected by their explicit or implicit connection with Conzzeta’s management model, particularly also the defined Group competencies (see the Strategy section). This connection highlights Conzzeta’s commitment to integrating sustainability themes as a whole in its management processes. As envisaged by the three-stage roadmap, in 2019 a Group-wide working group made up of representatives from all business units will address how to integrate the nine key themes in management processes, and how to develop targeted, consistent reporting. Depending on the results achieved by the working group, a sustainability reporting system consistent with international standards will be progressively implemented from 2019 onwards. 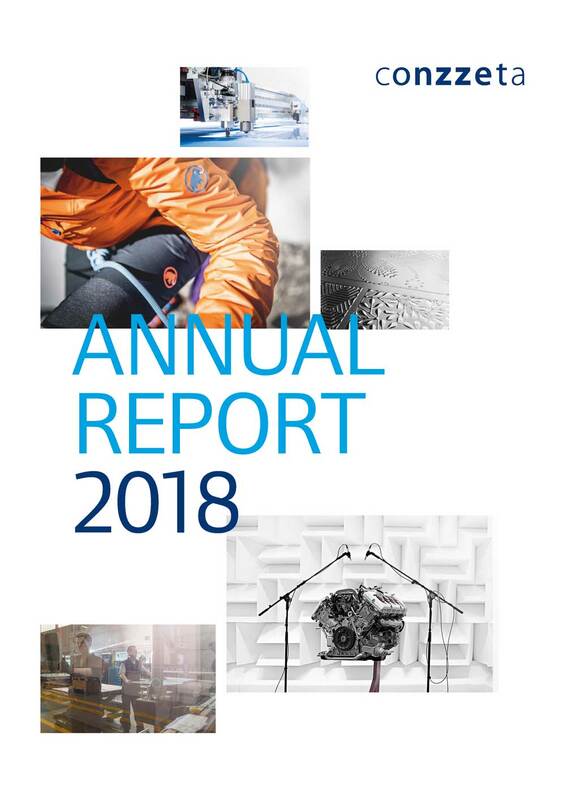 In 2018, the Outdoor segment (Mammut Sports Group) published transparent sustainability goals for the next five years as part of its "Mammut We Care" strategy. The new strategy involves four key priorities: 1) the protection of natural resources; 2) ethical production; 3) animal welfare; and 4) minimizing harmful substances in supply chains and products. Among the goals to be achieved by 2023 are, for example, the removal of environmentally harmful substances from the manufacturing process, and the targeted use of recycled materials to improve its ecological footprint. “We Care” continues on from existing sustainability initiatives that have been in place within the Mammut Sports Group for many years. In 2018, the Group celebrated ten years of being a member of the Fair Wear Foundation. The materiality process at Mammut Sports Group has helped it to become a pioneer in the climate change space, signing the UN Fashion Industry Charter for Climate Action as a founding signatory in December 2018.